Spacious shady, grassy sites on 11 acres-rare find in the Florida Keys! NEW premier RV sites and heated/chilled pool. Enjoy our high-speed internet, cable TV, Gulf fishing, or snorkel and fish off the dock and seawall. We live in North Texas and spend the month of March at the Jolly Roger. The park is attractive and very well-maintained. The scenery is gorgeous sitting as it does on the gulf of Mexico’s prettiest water. Lots of wildlife to enjoy including occasional visits from manatees. Management and staff are very professional and pleasant to deal with. The Jolly Roger has the best sunset views in the keys and we have witnessed numerous green flashes while staying there. great facility, friendly staff, we have been staying there for several years from early jan thru end of march and have not seen any where else we want to be. Older park..some sites very cramped...some very spacious...beautiful landscaping and pool..wharf, seawall, pavilion available....best thing about park is the ladies at front office....friendly and helpful...highly recommend. We stayed here for 3 nights and had a wonderful time. Our site was on the seawall as we requested. Staff very friendly and accommodating. We would highly recommend this camp ground and plan to visit again next year. Great location and some great sunsets BUT ants are out of control and they got into the coach. We got bitten all over and the resort could care less. Upon leaving we were told yea we have ants. When we arrived we told management and they said they could not put anything down that would be safe for our small dogs. They should have treated everything before we arrived. The grass is also full of sand spurs. CAMPERS BEWARE!!!!! We stayed seven nights at the Jolly Roger and loved it. It was off season so the park was not crowded. The staff were very friendly and helpful. The location is awesome. Very pet friendly, even includes a small dog park to let your pets run. They have a great dock to fish from, sitting areas to enjoy the view, and even a snorkeling area. We would highly recommend this campground and will defiantly return. We did not use the restroom so we did not rate it. We had a fantastic time at Jolly Rogers! Beautiful park right on the gulf. It's the only park we have ever stayed in where everything worked: cable and wifi. Great pool with chilled water! Nice folks! JR RV Resort is our home away from home. We enjoy our stays here, as it is right in the middle of the Conch Republic, as the Keys are known. The resort survived hurricane Irma with little damage. We are very happy that management did a wonderful job on a quick recovery, enabling for RV'rs to enjoy paradise. Understand that additional improvements are forthcoming. Life is good. This was our 7th year to spend the month of February on the seawall at the Jolly Roger. We have made some great friends that also return to this park annually. The staff are always friendly, the park is kept in top shape and the views over the Gulf are spectacular. They have an assortment of sites ranging from small tent sites up to the large rig sites. Before leaving this year, we made reservations to return again next year. Lush, tropical, friendly, asphalt roads, activities, and sunsets to die for. Office staff are the best...they can solve any problem! Thank You Jolly Roger for making our stay a memorable one. The job you've done in recovering from hurricane Irma is nothing short of amazing, your park was extremely clean, inviting and cheery. You staff was so very nice to us and we'll be back!! We just completed a 2 week rally with 42 coaches and had an amazing time! The park is great and has all of the amenities you could ask for. The staff is friendly and helpful and made our stay very enjoyable. We will be back again next November for the 3rd year in a row!! We stay here a couple of times a year, the staff is always helpful and friendly, our site was ample with a cement pad. They have a very nice pool and lots of security cameras. Marathon has several very good restaurants and the Dolphin Research center is a must along with Turtle Hospital about 7 miles away and Key West is about an hour away. If you have a boat this the place to stay with their dock only a few yards away from your site. Campground is very nice, we were lucky enough to get a large site right on the seawall, well worth the money. Swim area is nice with good snorkeling right at your door step. Staff is very personable and friendly took good care of us. We will be back again soon we love the location in the middle keys. You can get most places with just a little drive, depending on traffic of course. This is the 3rd time we have stayed at this campground. We just love it there. It is well kept, clean and has one of the most beautiful places to sit and watch the sunsets. Great location between Key Largo and Key West. We were in a grassy pull through near the pool. Friendly, helpful staff. Excellent showers and great pool. Very nice laundry room. First of all, the staff is what really makes Jolly Roger a place to stay. Cheerful and helpful in every way. We stayed over the Memorial Weekend and the Keys were busy. Campsites were reasonably level and we only needed to level our 24-footer, front to rear. Water, electric and sewer hook-ups were easy to access and each campsite had it's own concrete patio with picnic table. If you plan to barbecue with a portable/table top grille, bring your own table. There is a restriction on using barbecue grilles on the picnic tables. The Laundry, Restrooms and Showers were very clean. However, for a holiday weekend, the restrooms and showers were strained by a nearly full campground. For the Keys, rates are extremely reasonable and the office had brochures and information for most of the Keys' attractions and restaurants. Being at the Jolly Roger puts you in a convenient locale to tour the upper and lower Keys. We made it to Key West, in heavy traffic in just under an hour at local speeds. Since this is only our second year as RVers, I found the pull through sites well spaced for a rookie. Exiting the site was not a problem either. Although, if the camper across the road, parked his/her tow vehicle directly across, even an experienced RVer might have to ask the opposite camper to move his/her vehicle. Overall, we would go back in heartbeat. The location, facilities and staff were very good and it was a pleasure to stay there. While there was no camper oriented store on premises, there were plenty of stores within reasonable distance to handle any extra needs. They offer GoodSamClub and Military discounts. What a great little gem in the middle of the Florida Keys! I'm sure there are folks who wouldn't like this resort because there's not a fancy campstore or tons of knick-knacks to buy, they would be missing out. The staff is friendly, helpful, and always wear a smile. The location can't be beat. Just a nice drive to Key West or up to Key Largo. Many fun things to do in the area. Great restaurants nearby. The sites offer a nice amount of space. And did I mention you could have a site right on the Gulf? All in all, a great place to camp! Campground had clean grassy sites with a paver stone patio. Pool was very refreshing. Campground is on the water, with a small beach, boat launch, pier and sea wall. You are roughly in the middle of the keys so it is easy to visit all of the keys. We had a 40 foot class A and there was lots of room to maneuver. Highly recommend this property. We stayed 4 nights and would of stayed longer if we had time. Stayed three nights and were very satisfied with the facility and the amenities. Bathrooms and showers were squeaky clean and the appearance of the park was good. Could use a little cleaning up but overall was good and we would definitely stay here again. Location is good if you want to make a day trip down to Key West. Great location, clean and quiet. Wonderful spot to watch the sunsets. Small campground but easy to navigate in our 40 ft motorhome. Be watchful for sign at road, it's hard to see. Will definitely stay here again if in the area. Had a great month!! Many great neighbors while there. 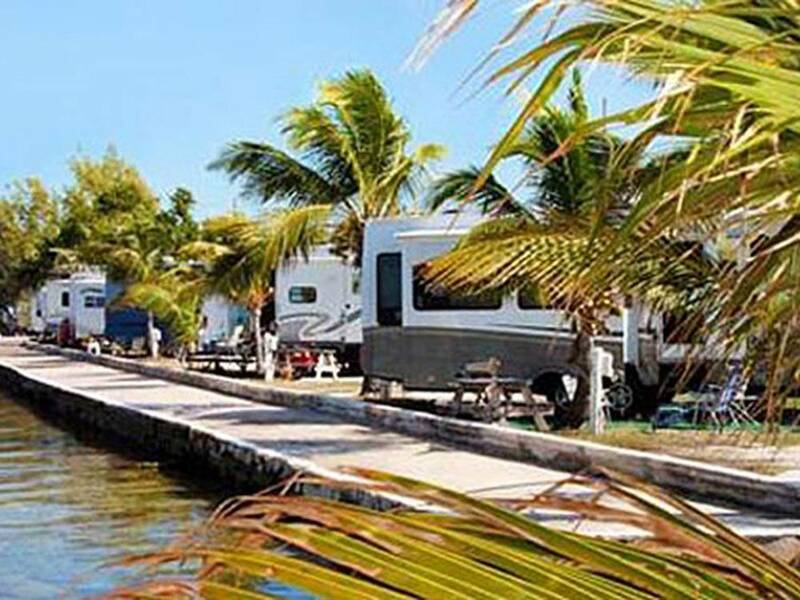 This is one of the smaller campgrounds I've stayed at in the Florida Keys. Love the location because it is right next door to the Dolphin Research Center, a quieter part of the keys where you can find good restaurants, biking and hiking trails and is in the middle keys. Fishing is great even for the shore. The campground itself was very quiet and is family and couple oriented. Loved sitting with the community to watch the sun set at their tiki island. They have a large dog park with trees and a good sized pool. There is no beach in the campground but lots of areas to relax by the water and watch the world go by. Everyone was very friendly and even though you heard children playing during the day it was very quiet at night. Spaces are a bit tight but you can set up your camp with quite a bit of privacy if you take a little extra time. This has now become one of my favorite Keys campgrounds and we all wanted to stay longer when it was time to go home. Overall this is an average campground. It is halfway down the Keys so they hit you with the $90 a night charge which is expected. The staff were friendly but they are understaffed. When we came to check in there were 4 RV's stacked back in the road and there was only 1 person at the desk. She did a great job but needed help. They have a roped off swimming area next to the sea wall that was nice but no actual beach. Pro's - It's the Keys, Nice Tiki Island to watch the Sunset, Friendly Staff, great dog park! Con's - Small sites, we had to move the picnic table because our neighbor's slide out was right next to it. Tight corners. No Beach, only 1 bathroom and it was on the other side of the park (only 2 male showers for the entire park). No playground for kids at all. I would say about 40% of the people there are long time residents (3 or more months) Overall we had a great time but I would most likely look for a different location next trip. This is a great RV park, it is clean and organized. We spent a couple of days with friends here and we all enjoyed ourselves with ocean breeze and beautiful sunsets. The park is close to all sorts of services like restaurants and stores it is also close enough to visit Key West if that is in your plans, we did. Short and sweet if you plan to visit the Key’s we recommend Jolly Rogers. Stayed in a pull through site that was fairly level but a little snug with the neighbors. Sewer hookup is a long way from the power and water so be prepared to have longer drain lines or power cords. Park was full of both long and short term campers but everyone was friendly and helpful. We left a day early and thought we wouldn't get a refund but to our surprise they reimbursed us for the full day. Thanks! The people were very nice that run the place. Restrooms are cleaned many time a day. Pool is nice and clean. RV lots are a tight fit to get into. Boat ramp free to use the only issues I faced were there were no tie up cleats on the wooden boat docks and you are not permitted to tie up jet skis over night. Camp ground is very dog friendly. We were making one stop in the Florida Keys and wanted something in the middle keys. The Jolly Roger is on Grassy Key at mile marker 59 and is part of Marathon, FL. It is on the Gulf side, on the water with a boat ramp and boat docks. The driveways are asphalt which are in good condition and the site pads are grass with a concrete patio and picnic table. The bathrooms are in good condition and are kept clean. The laundry is nice with plenty of machines. The free WiFi worked well for us. We had a back in site located in the interior section. We had full hookup with 50 amp electric. We paid $42 per night with Passport America discount. We had a back-in site on the Seawall. The staff was always helpful and friendly. The park is always clean and we have never experienced any facility problems. We really enjoyed the aquatic wildlife. Saw manta rays, huge turtles, pompano, barracuda and even a 6 foot shark. This is our 7th year visiting and we can't wait to go back next year. We only did a one nite stay and the park was not full up (off season) so we loved it. Great location and felt like we had plenty of space to watch the great sunset, walk the pier and go for a swim. This place had all we needed. We have stayed at JR mostly winter, (Feb-Mar). Have stayed during the summer (Aug) on a few occasions. The staff is excellent, always trying to accommodate. Never a problem that wasn't fixed, or attempted. Several attempts were made to improve wifi, but I guess it's difficult when you have some trying to download too much, and not caring about fellow campers. Beautiful setting by the gulf. Friendly and helpful folks. We will return next year. This was a great park to stay at as it was midway down the Keys. We were right on the sea wall and greatly enjoyed the location. We were able to drive down to Key West and visit the other southern keys as well. The sites were good size, tho not level. The Dock was great to fish, watch boats, swim/snorkel, and watch the sunset from. The pool was clean & just the right temperature, plenty of lounge furniture in good condition. The signage was a little difficult to see from the highway, but once we were there we had no problems. Staff was friendly & helpful. The only issue I had was the laundry. It was clean and well kept. The 3 dryers I used (25cents for 5 minutes) did not dry very well. It took $3.00 per machine to get my clothes/towels dry. We would recommend this park and definitely would stay there again. Where else can you swim in the sea and a fresh water pool? Pulled our camper from SC to the Jolly Roger for a Spring Break stay with the family. It was amazing. The campground was super clean and the staff could not have been more warm and caring. Our sight was a pull through sight (#14) and it was lovely. It was a little bit of a skill test to fit our 37 ft travel trailer around the big tree on the sight but we made it. The snorkeling off the sea wall was amazing and my kids loved it. We will be back and most for sure stay at the Jolly Roger. Best Time Ever in the keys with the family. Thanks so much Jolly Roger!!! Was a very nice campground, well maintained! Staff was friendly & helpful! We had a lot that backed up to swimming lagoon. Beautiful views!! We enjoyed the fishing pier too. The water in the lagoon was crystal clear!! Lots of sea life to observe while snorkeling. The only problem due to the bottom really difficult to walk in. But overall really nice!!! We would book it again. Stayed at this park for the month of March. I'll start with because we're finding it a rarity that the office staff were nice, friendly and helpful, thank you for that. We started our stay in an interior plus site which had partial ocean views depending on who was in front of you. The site itself was fine, somewhat spacious if there is such a thing in the keys, but the sewer layout is terrible. The neighbors sewer hook up was located under our picnic table right at our slab. We later moved to a harbor side site which was very large and great views. We were lucky they had a cancellation the last week of our stay. The negatives of the park are the no see ums, which we're not used to from where we come from. Within 2 days we had bites all over. The harbor side space had an ant problem. We tried spraying outdoor ant spray and they still kept on coming. There are a lot of rules at this park which I think is great, but at times the inconsistent enforcement of rules was annoying. All in all if we could get an ant free harbor side site again, we'd return in a heart beat. This was the most enjoyable stay of our 3 months in Florida. The office staff was very friendly and the seasonal residents were delightful, inviting us to happy hour activities, birthday parties, and other social events. We were fortunate to get an outstanding site adjacent to the ocean. Great bicycling opportunities and swimming and snorkeling just steps from our unit. We highly recommend visiting Jolly Roger. The only downside is that it is a very popular resort and finding a vacancy may be difficult. Also, the Keys in general is a pricey area so fees are substantial. Stayed Feb and Mar. Staff is good to great, mostly helpful. Sites are clean, small to large. Last year was a huge price increase, this year another 5% total. Wifi is free but mostly useless. Been that way for ten years even with improvements. Change to Direct tv and the picture is horrible. Same as when Comcast was there. Nice campground. Nice people. Laundry room, even redone is small and equipment not suited for the size of park. With all that the park is nice. Great location, wonderful sunsets, nice friendly Staff, and very accommodating. Pet rules did not work for us and we left early as a result. Pets are not allowed to do any business other than in the pet park or on the road on the way to the pet park. Not even allowed to go on your own site even if you clean up as we always do everywhere we go. Pet park smelled very bad of urine. It was quite hot and humid when we were there so perhaps that was why but in fact the whole park had a strange septic smell going on. We left two days early and got a refund no problem, so that was great and much appreciated, but we wont be back. It was just not the place for us with our pet. 43ft w/ 20ft trailer - Had to drop trailer but staff put in very accessible location & moved to easy spot when we were ready to load, hook up, leave. Friendly, quiet, friendly staff park. Very pet friendly with adequate fenced in dog park. Most sites for Class A have concrete pad - ours did not! Some shaded sites. Good snorkeling, lots of sea life along wall - no lobster harvesting! Will bring our boat next year. This was our 3rd stay . Nice place with all the amenities needed. Good staff always helpful. We like that we can bring our boat. Lots of fishing. Nice dock to watch the beautiful sunsets. Always a very relaxing stay here. Staff is exceptional. Generous with assistance and happy to assist The maintenance crew was very helpful and solved by battery problem quickly. Had a bad experience this time around. Stayed her twice before but probably won't again. Four campers FULL of kids near us, parents didn't care what they did, ran around screaming day and night. Throwing fish nets in the "no fishing" area, taking all the lobsters out of the snorkel/swim area. You would think that in October these kids would be in school! The worst part was the Management of the campground didn't care either, we notified the office but nothing was done! I had to pay a deposit for my dog and if I didn't follow the rules could be thrown out, but apparently no such rules for wild kids. We left three days early, couldn't take it anymore. I emailed the management when I got home and got a "Gee, we're sorry, hope to see you again soon" email back! A refund of our money for 4 days of aggravation would be more appropriate!